The Company’s selection includes classic works by Ashton and MacMillan, an award-winning recent work by Wheeldon and new piece from within the Company. Frederick Ashton created the Voices of Spring pas de deux as a divertissement for The Royal Opera’s first production of Johann Strauss II’s operetta Die Fledermaus, first performed in 1977 on New Year’s Eve. Ashton used Strauss’s lively Frühlingsstimmen waltz from 1883 (some years after the operetta’s 1874 premiere). His jubilant choreography is filled with gravity-defying lifts – the ballerina appears twice to walk on air – and flurries of dazzling, weightless steps. It was first performed as a stand-alone piece in 1978, and has been a regular feature of The Royal Ballet’s repertory ever since. Choreographer and Royal Ballet Principal Character Artist Alastair Marriott created Borrowed Light on Royal Ballet First Artist Marcelino Sambé, for the inaugural Ann Maguire Gala in 2015. A personal reflection on ‘borrowed light’ – the idea of light entering a dark space from another source – the piece exhibits Sambé’s virtuosity, while at the same time moving away from the typical male bravura solo to highlight more sensitive, expressive elements. Marriott used Philip Glass’s Piano Etude No.2, while his regular collaborator Jonathan Howells (a Soloist with the Company) designed Sambé’s costume. Royal Ballet Artist Calvin Richardson joined the Company in 2014. He created his contemporary re-imagining of Anna Pavlova’s famous Dying Swan solo in 2013, while still a student at The Royal Ballet Upper School. Choreographed to Camille Saint-Saëns’ cello solo ‘Le Cygne’ from Le Carnaval des Animaux (The Carnival of the Animals), Richardson’s piece takes inspiration not only from Pavlova’s original but also from a street-dance remake of the solo. Richardson danced the solo at the School’s 2014 annual performance at the Royal Opera House, while fellow Artist Matthew Ball performed it as part of that year’s Deloitte Ignite Festival. Le Train bleu originated as an all-star collaboration for Sergei Diaghilev’s Ballets Russes in 1924, with choreography by Bronislava Nijinska, scenario by Jean Cocteau, music by Darius Milhaud, costumes by Coco Chanel and a backdrop by Pablo Picasso. It was then not performed for more than sixty years until a revival by Oakland Ballet Company in 1989; it returned to Paris, its original home, in 1992. There is no blue train, despite the ballet’s title: Diaghilev wrote, ‘This being the age of speed, it has already reached its destination and disembarked its passengers’ – a group of fashionable Europeans on a Mediterranean holiday. The solo performed by Vadim Muntagirov and James Hay is ‘Le Beau Gosse’ (the Handsome Young Chap). Christopher Wheeldon choreographed his Olivier Award-winning ballet Aeternum in 2013, setting it to Benjamin Britten’s Sinfonia da requiem in recognition of the composer’s centenary year. In this pas de deux, which opens the third section of the ballet, Wheeldon’s choreography incorporates weightlessness with more grounded movement and moments of tension and release in a never-ending stream of motion that eloquently reflects Britten’s transcendent ‘Requiem aeternam’. Rodgers and Hammerstein’s 1945 musical Carousel is dark in its themes. A young girl, Julie Jordan, falls for carousel roustabout Billy Bigelow. They marry, he mistreats her, and is then killed while attempting a robbery, leaving Julie to raise their child alone. Director Nicholas Hytner asked Kenneth MacMillan to create the choreography for a 1992 revival at the National Theatre; MacMillan agreed, but died of a heart attack before finishing the choreography. This pas de deux was one of the last things he worked on. This famous ballet sequence sees Billy – now dead, but allowed to return to earth for a day – watch his young daughter, Louise, falling for the leader of a group of roustabouts, just as her mother had for Billy. The pas de deux has the intensity of emotion and complex undercurrents that are such familiar signatures of MacMillan’s greatest work. 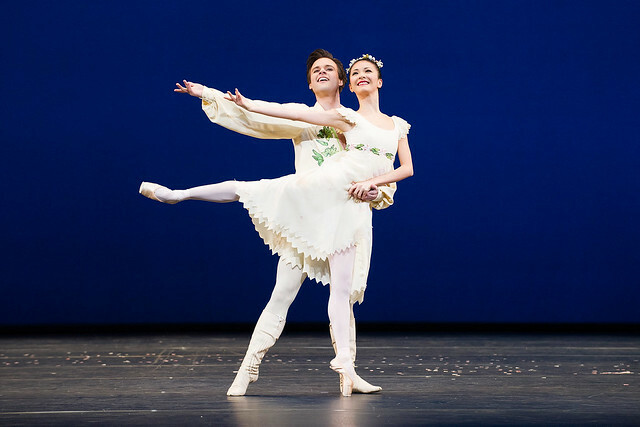 The Royal Ballet will perform these divertissements in a mixed programme with Infra and The Age of Anxiety at the David H. Koch Theater in New York, 27–8 June 2015, as part of their 2015 USA Tour.